Writing Rain – Write with us! Between the winter I spent living in Chile’s southernmost islands, and the following winter in which a self-defining relationship crumbled beneath me, I drafted, edited, and compiled dozens of poems, three of which would be published in literary magazines in a series of several months. Now, finally settling back into a sense of stability, of serenity, the tap has run dry. I haven’t written anything worthwhile in well over a month. 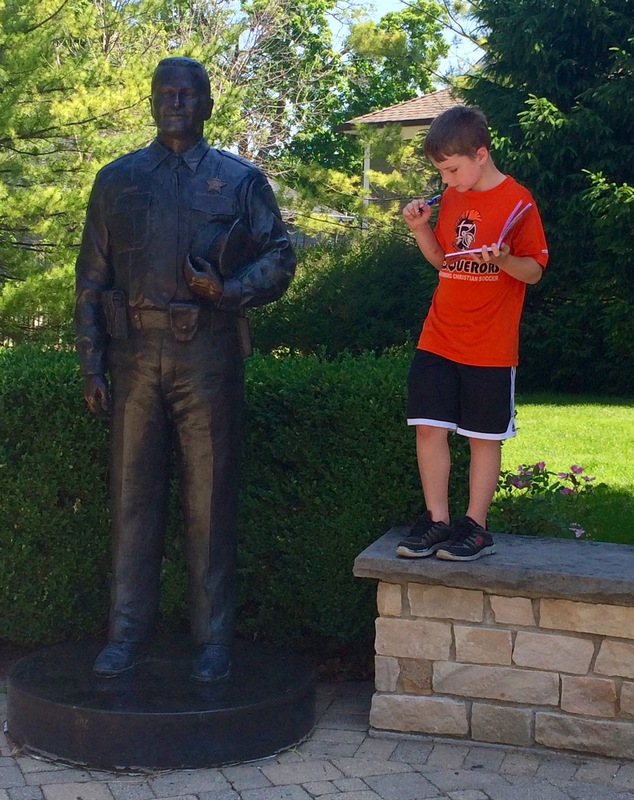 Elliot getting inspired by his new protagonist, a statue in Memorial Park. Writing comes as a series of ebbs and flows. It seems, though, that when life is most hectic, most challenging, most painful, words simply pour out…whether a change of scenery which flips perspectives upside down in the best sort of way, or the loss of life as we once knew it in the worst sort of way, there is just more to say. In the quiet moments, when things are finally okay, falling into place, what’s left to comment on, to question? 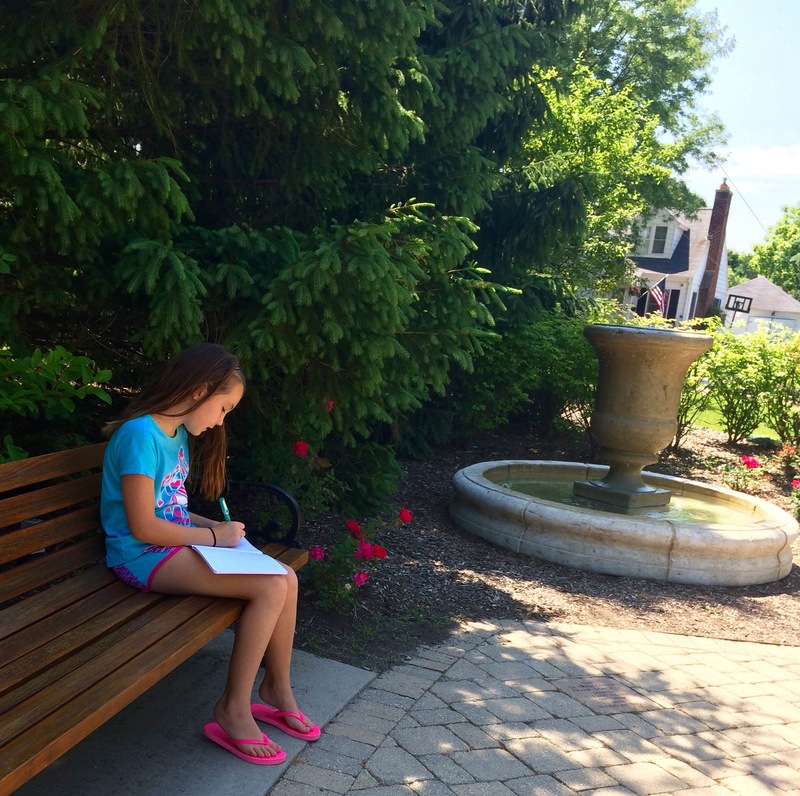 Aliyah kept her pen to paper for the better part of the morning, weaving together flawless realistic fiction. Having spent just six hours this week with TT Patton’s 3rd and 4th grade writers, I am pushed to question just what it is in their lives that keeps them so inspired? I’ve always found fuel in the moments undeniably striking, the ugly days, the faint of heart, or in boldly-spirited midnights, and my 3rd graders simply haven’t dealt with a whole lot of those yet…so what keeps their pens to paper? These kids are comfortable, so comfortable with the lives they’re living that they don’t need to extract source material from them; rather, they feel free enough to wander into other worlds, and explore. When did the rest of us stop doing that? How do we get back there? I think it’s time to accept the moments in which my life is mellow as an ebb, giving me the opportunity to step out of my own life, to escape, explore the places in my own mind, to keep a dream journal. It’s time for a wave of pure fiction, something I’ve never dove into. I suppose maybe there is still some challenge left here, after all.